Category Archives: Credentials: Useful for Career Changers? Do Credentials on a Résumé Help when Changing Careers? Well, first of all, my apologies for being offline the last month plus. I just completed the Second Edition of Confessions of a Hiring Manager Rev. 2.0, and 50 Things You Can Do NOW to Help Keep Your Job. Both should be available now from Amazon.com and CreateSpace.com as well as your favorite bookstore and library. I’ve also been busy preparing presentations for the Association of Certified Fraud Examiners Annual Conference to be held at the Gaylord Resort in Orlando, Florida. I’ll be giving three presentations, participating on a panel discussion, and working in the Career Connection center answering career strategy questions and perhaps doing some individual career counseling with attendees. The ACFE annual conferences are always a great event with great people. Not all professional credentials are created equal. Credentials are vital to folks seeking to change careers or advance within their own. But the extent of their value and use varies from one industry to the next, so it is important to understand exactly how a professional designation/ credential can best serve your career aspirations. Many professional credentials are awarded after rigorous exams and verified experience—some may require degreed standing as well. They attest to the knowledge and expertise of the credential holder. Credentials are vital to folks seeking to change careers, but their use must support your strategy for the career change. You can’t expect a “Certified Financial Planner” designation to help if you want to get into brain surgery or electrical engineering. The proper credentials can make it easier to climb the corporate ladder with your current employer or help push open doors a little wider to those professions that may lie on the periphery of your functional expertise. Here’s an example from my experience: I was working as a geologist/geophysicist from 1980-1986 and as part of my unofficial responsibilities, I also served as the division’s editor for technical papers. I was one of the first group of geologists to get certified on Intergraph digital workstations when I was at Phillips Petroleum. The IBM PC was just hitting the stores, and digital workstations were becoming more and more commonplace in oil company exploration and production efforts. The week-long class paid off when I got laid off from my last oil company job. It took 9 months, but my next position was as a technical writer/editor for a company that manufactured geological mapping software for use on…..Intergraph digital workstations and other large computers. You can see the peripheral relationship between the two jobs/careers. My résumé focused more on my technical and computer skills and had less emphasis on my geology/geophysics knowledge and experience. That certification helped launch successful careers in the software development and microprocessor design fields. Folks changing careers would do themselves best by placing their certifications ahead of the formal education section on a functional résumé. Why? If you’re changing careers, I (as the hiring manager) am more interested in the skills, knowledge, and experience that can transfer–and that includes certifications and licenses–than I am about your formal education. And that is the key to using certifications or licenses when changing careers. 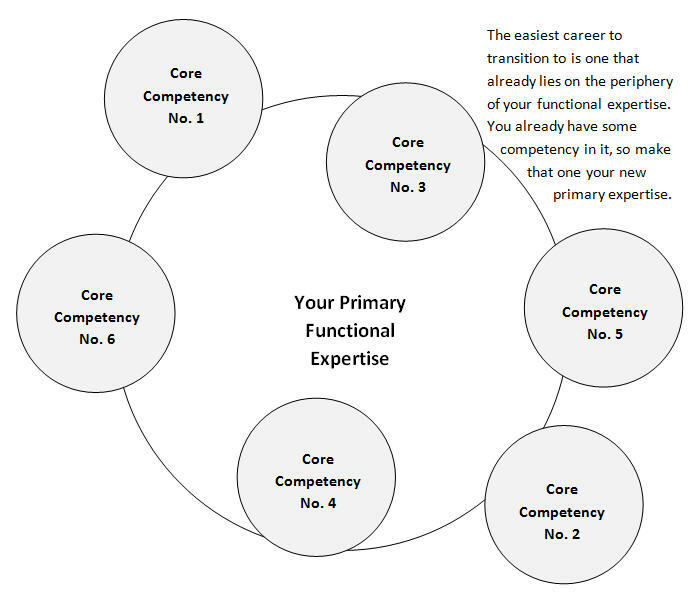 Imagine that your functional expertise is a large circle, and all the ancillary skills, knowledge, and expertise (called core competencies) are smaller circles overlapping all around the edge of the larger circle (see the above figure). Some circles have a larger overlap than others, depending on the strength of the expertise in those peripheral areas. Career changes are easiest to manage when the transition is from an existing functional expertise to one of the overlapping core competencies. 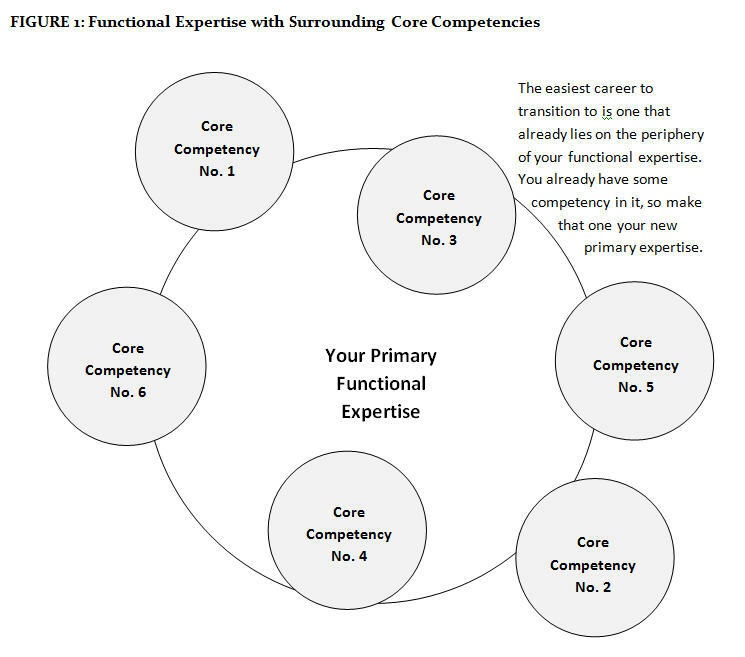 In time, that core competency becomes the new functional expertise. Career changes are far more difficult when trying to move from one functional expertise to another—jumping from one large circle to another that has very little or no overlap. Usually, such career changes involve additional education (college degrees, other certifications and licenses, etc.) not to mention some experience in that field. Be mindful that many recent college graduates (RCGs) are entering the workforce already armed with bleeding-edge knowledge and the latest skills. With mid-career changers and college graduates competing for the same positions, lower compensation considerations for RCGs will in many instances drive the decision as to who gets hired. Hiring managers are most interested in only those certifications and licenses you actually possess, and not all the coursework you took along the way. In some instances, candidates use this approach to disguise the fact that they may not have the requisite educational requirements. I wrote in Confessions of a Hiring Manager Rev. 2.0 (Second Edition) that the most recent recession has created another “time of parenthesis” as John Naisbitt called the 1980s in Megatrends. The education system must respond by preparing individuals to help shepherd business and technology processes in mature and emerging economies over the coming decade. Online colleges, business and trade schools, community colleges, and certifying organizations must step up to meet the demand for qualified professionals to address the challenges and opportunities the world economy will face.